Shimmer and shine for easy handmade cards! Learn to create simple die-cut card embellishments with versatile Shimmer Sheetz! Shimmer Sheetz are lightweight sheets of iridescent Mylar from Elizabeth Craft Designs. They’re high-shine, high-reflection and while they’re really quite sturdy, they’re also flexible and easy to cut with scissors or die-cut with a machine. I love them for die-cutting because it’s a great way to create easy embellishments that add a lot of style to your card. Use the Crystal Flower set to cut two flowers from Yellow Iris Shimmer Sheetz. For my Cuttlebug, I made the following sandwich: Plate A, Plate B, cutting die (cutting side up), Shimmer Sheetz, metal adapter plate and cutting Plate C.
Die cut the Crystal Flower Overlay flowers, the large flower from white cardstock and the small from black. Layer the die-cuts together as shown, applying adhesive in the centers underneath a red button. Brayer a piece of white glossy cardstock with Mermaid paint; let dry, then stamp the Dutch flowers and the script as shown. Mat the long edges of the painted background on red, then black cardstock. 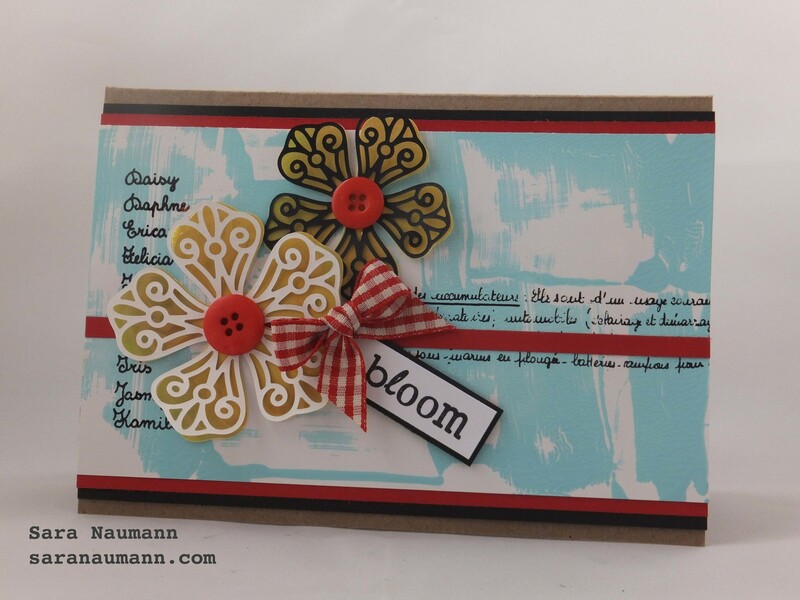 Form a card base from kraft cardstock and glue the painted piece across the center. Add a narrow strip of red cardstock. Glue the flowers as shown. Stamp “bloom” on white matte cardstock and mount on black, then foam-tape to the card front. Tie a bow in gingham ribbon and glue.